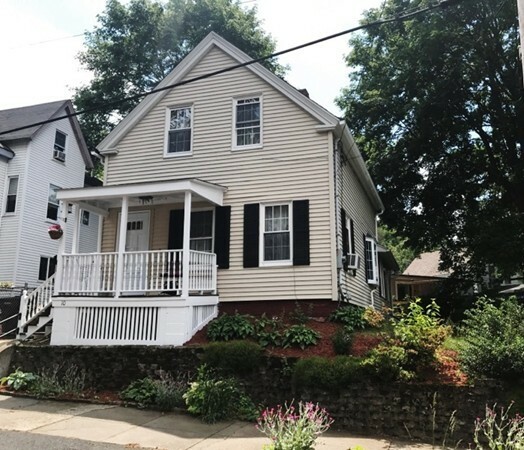 Check out this cozy Colonial in the Bradford section of Haverhill! The first floor consists of a living room, a dining room with bow window & built-in china closet, an office with laundry hook-ups, a pantry, an eat-in kitchen and a full bath, both with C/T flooring. The 2nd floor offers 3 bedrooms. Most rooms are freshly painted! Amenities include: vinyl siding; D/G replacement windows; roof shingles about 3 years old; a young furnace; newer W/W carpeting in the living room and 2 of the bedrooms; newer gutters with 'gutter helmet' on the front and 2 sides; and a patio in the back yard. Close to Riverwalk, downtown Haverhill, & Bradford Commuter Rail, plus offers easy access to Rts. 125 and 495. FHA buyers, come see this home!